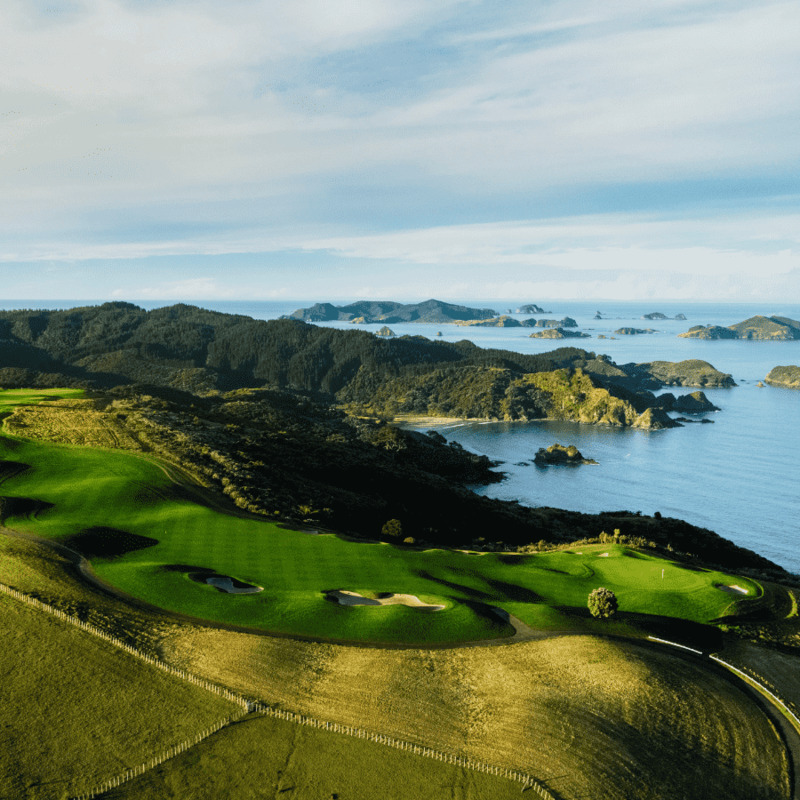 Julian Robertson’s ‘The Lodge at Kauri Cliffs’ is the embryonic Golfing and luxury lodge Experience in New Zealand. This has paved way for lodges like Cape Kidnappers, Kinloch Lodge and more recently Tara Iti. We were lucky to enjoy a weekend here, and we thank Julian, the American Hedge Fund manager for directing his compass to the remote far North of New Zealand, in 2002. I was joined by my partner and had departed from Mangawhai Heads (Tara iti), a scenic 2.5-hour drive from Kauri Cliffs. The approach to the lodge was rural with the only signs of civilisation a couple of boys on horseback and rolling farmland. We found the sign to Kauri Cliffs and our luxury weekend was underway. After a warm welcome by Tatsio, our lodge assistant, we were quickly guided to the balcony with champagne in hand, where we were given an explanation about the property and a chance to survey where we will be spending the next 48 hours. Being Kiwi, we can become accustomed to jaw-dropping scenery, but this was like seeing my country again for the first time; in the foreground there was pristine fairways which laid runway for a sheer cliff face, plummeting into golden beaches. A luminous cloud covered the sun that was radiating towards an Island archipelago. Two things became immediately evident, the staff are extremely attentive and the scenery becomes your Mona Lisa of the Stay. The Lodge itself is in Colonial Style and captures the area’s rich history. In winter, large open fireplaces warmed intimate dining spaces and a feature is a balustrade which runs around the perimeter of the building, leading out to a memorable deck for dining. Families and smaller golf groups are scattered either indoors or outside enjoying the outlook with lunch and drinks after golf. The lodge itself feels like an elegant home, with superior service, but Mr Robertson has obviously emphasized to the staff, that they shall maintain their New Zealand charm and well natured humor. The weather was good and the course was quiet, Kauri Cliffs are never overcrowded with the aim of maximising a Golfers experience. The club pro, Ben, was happy join me in 18, my partner has opted to swap the putter out for a massage at the Spa. The course was in immaculate shape and the greens were running at 10 on the Stimpmeter, not bad for the middle of winter. The front nine shows off the wonderful coastline and on this occasion a fair level of wind power. Armed with the skills of a 12 handicapper, meaning lack of low shots and bump and runs, I let the wind ‘guide’ my ball around the course. The fairways were wide enough and the contours would suit my stroke play, i.e, the ‘regular Golfer’, but there will still a variety of landing pads to tempt any Gofer or strategize your way around each hole. My favourite hole on the nine was the 478 Par 5, number 4, which tapers down and towards the right, before ending at a green; sitting at the point of a cliff face and minimal margin for error if you go long. The back nine brings a new Golfing Experience altogether, holes 10-13 guide you through local farmland, grazing livestock and is looking back at you suite accommodation. The Marsh areas border secluded greens and you feel like you have the course to yourself. A short traverse to the 14th tee and elevated gives you a major taste why this course is a great showstopper. 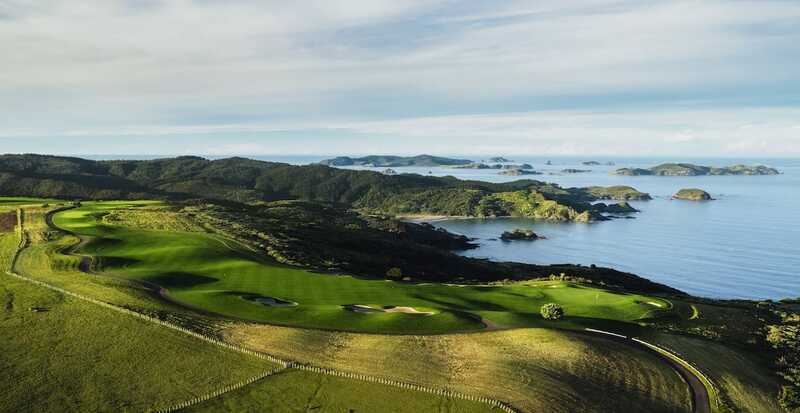 For the next 4 holes, the left side of the fairway is a sheer cliff face, the sparkling ocean wraps around the base of the dotted Cavalli islands; this view can only be seen from Kauri Cliffs. You don’t need to be playing the course to appreciate this experience and the camera takes even more precedence than your putter. Thankfully, I was playing the back 9, in calm winds so I managed to find the fairway and greens in regulation, Kauri Cliffs is a course that rewards a good shot, allows for a slight margin of error, but punishes poor golf with your ball OB, or in one of many bunkers. Back 9 of Kauri Cliffs, may be the most picturesque I’ve played, anywhere. The pick of the back nine is the Par-4 16th, a 323-yard dogleg over the ravine. A tempting proposition for the risk taker would be to take on the green, I fall into this category but feeling belittled by the surroundings and trying to save my scorecard, I decided to take it easy. Aiming right you from the tee allows a beautiful approach to a green perched in front of the horizon. In summary, the round at Kauri Cliffs is a lot of fun and a perfect example of how a Golf Course can be used to aesthetically improve a natural landscape. Whilst presenting a challenge, I did not find the course too difficult, but I can imagine that would change when the wind is high. The conditions were immaculate and I can see why Kauri Cliffs are comfortably sitting in the World’s Top 40 year on year. Following Golf there is plenty of time to relax in your room before dinner as time is yours at The Lodge. The suites are detached and a short stroll through the native bush from the Lodge. They are of generous size and a feature is a romantic open fire. The bathrooms are royal and the bathtub is the perfect place to unwind after Golf. Every suite comes equipped with a balcony that overlooks the Golf Course. The decor has a native New Zealand feel, a natural palette and wooden Wicca furnishings. Kauri Cliffs give you a presence of feeling at home, with no pressure to leave your room. The dinner at Kauri Cliffs, which is included in your stay, promotes a seasonal New Zealand and you may order a la carte or opt for a 5-course tasting menu, which we did. The aged grass-fed beef was the highlight and the dessert selection was a great way to cap off a special meal. Overall Kauri Cliffs had etched a sublime memory for us and it provides a luxury oasis for anyone looking to relax and unwind. The Lodge can be enjoyed throughout the year and offers a range of Experiences to maximise your stay, including; deep sea fishing, an epic 4WD tour, a private beach picnic etc. Experience Golf would love to assist in your travel arrangements, from visiting the Lodge for one round of Golf, a weekend away or combining it with some other Golfing Experiences.